Usk & Railway Inn01874 636101work Restaurant - PubThe Usk & Railway Inn is a well stocked country inns with Beers, Lagers, Real Ales, Cider,Spirits, Malt Whiskies and Wines from around the world and a good selection of soft drinks, including tea, coffee and hot chocolate. A varied menu using local produce whenever possible is served in the bar or dining area - meat is from the local butcher and eggs are all local free range. If you just want a snack, expect everything from jacket potatoes to paninis, soup to cheesy garlic bread or even just cheesy chips. 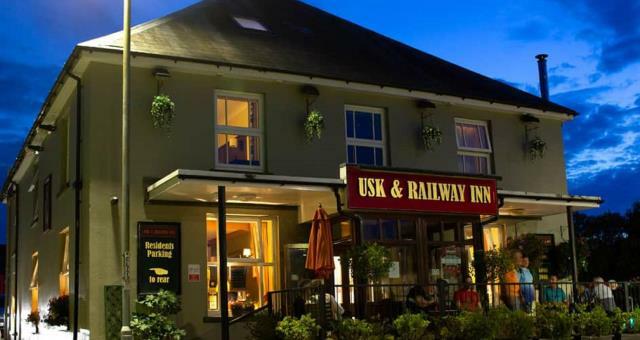 The Usk & Railway Inn is a well stocked country inns with Beers, Lagers, Real Ales, Cider,Spirits, Malt Whiskies and Wines from around the world and a good selection of soft drinks, including tea, coffee and hot chocolate. Parties and special occasions are catered for, with everything from a roast meal to a finger buffet. Follow the A40 past Brecon and head towards LLandovery. When you reach Sennybridge you will see us on the left hand side.